️ Too Hot to Handle? Back in the daze I could actually EAT and not just fantasize about eating, I really loved spicy foods of all kinds. I developed my taste for Spicy Foods in Brazil as a kid, adding "Pimiento" ️ to my Feijoada Dinner. Pimiento was just hot peppers️ in a bottle filled also with Oil & Vinegar to extract the capsascin, whici is what makes Hot Peppers️ HOT. After that, I got turned on to HOT Chili and HOT Szechuan Chinese food. HOT Cajun recipes too! In fact for a while in my eating years, no food could be too spicy. Apparently other people like super hot foods, so in search of customers some farmers have bred up even MOAR SPICY Hot Peppers️. 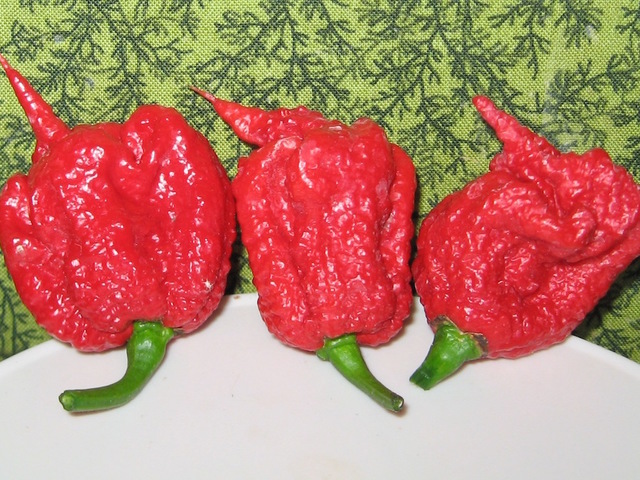 The latest breed ranked highest on the Scoville Heat Units Scale @ 2.2M Scoville Heat Units is the "Carolina Reaper". This is about 100X hotter compared to a Jalapeno Pepper and 10X hotter than a Habanero Pepper. Now, I cannot really see a need for a pepper THAT hot. Habaneros are so hot if you add more than one to your Chili you shoot flames out of your mouth like a dragon. Why do you need a Carolina Reaper? Apparently though, some Darwin Award candidates have tried to eat Carolina Reapers raw and whole, causing a variety of medical problems. A maker of the Carolina reaper hot pepper is defending distributing the pepper after a man became hospitalized from eating the pepper, the UK's Sky News reported.